Summary from Goodreads: Georgie McCool knows her marriage is in trouble. That it’s been in trouble for a long time. She still loves her husband, Neal, and Neal still loves her, deeply — but that almost seems besides the point now. I've been hearing so many amazing things about Rainbow Rowell, but for some reason I still hadn't picked up any of her books. If I'm being honest, I probably wouldn't have picked up Landline right away either, but the buzz at BEA about this book was huge. I just couldn't pass it up. Well, I am now a Rowell convert - I will be reading ALL of her books very soon! Landline is a time travel book of sorts - without the travel. Georgie's marriage is falling apart because she puts her work above her family. But when she discovers a way to talk to her husband in the past, she finds herself remembering how they started out and what brought them together in the first place. Georgie feels like she is somehow supposed to put something right by talking to this past version of Neal. But she has no idea what - and wonders if she might instead be unraveling her life as she knows it. The storytelling style. The story is told by switching back and forth between Georgie's current life and her life when she first fell in love with Neal. Because of this, we learn more and more about what drew them together as the book goes on. We see the problems in their marriage juxtaposed with the good times, which keeps us emotionally invested in their relationship and draws us into their story. Realistic characters. I think the main thing that makes this book so compelling is the absolute realism of the characters. These people are flawed, certainly - sometimes I wanted to yell at them to wake up and see what was right in front of them - but they are also striving to be more - to be better. Georgie and Neal are real and their struggles are real. Even when you add time traveling phone calls into the mix, it all still feels real. Because the story isn't about time travel, it's about a woman's emotional journey. Georgie is at a crossroads and she needs to come to terms with how she ended up on this path - and decide whether or not it's all worth it. In real life, the answers to these types of questions are rarely simple. Rowell captures that complexity beautifully. All the Feels. This book inspired me to write a whole post about the emotional turmoil that a book can put me through. As a wife and mom, I was extremely connected to this storyline. Even though my marriage is strong, I think that any wife and mom can relate to the pain that Georgie feels when she fears for her marriage, when she feels that her family might be falling apart. I ached for her and was so hoping that she would come to her senses in time (and that Neal would too!). This book made me laugh and it made me cry - not to mention the whole host of other emotions I went through as I read! Neal (at first). I have to admit that it took me a little while to understand what it was about Neal that Georgie was attracted to at first. He was sort of curmudgeonly and didn't express his feelings much, and he wasn't great at communicating. It took me a while of reading the back story (the part of the story that took place in the past) to really see the connection between Georgie and Neal. I did get there, though (obviously!). 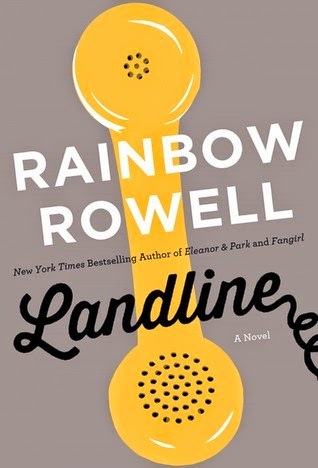 Landline was an amazing story about the choice we make each day to love, even when it's hard, even when we can't possibly know what the future may hold and if love will be enough. I feel like I just don't have enough words to explain how much this book impacted me. Definitely 5/5 stars. “You don't know when you're twenty-three. You don't know what it really means to crawl into someone else's life and stay there. You can't see all the ways you're going to get tangled, how you're going to bond skin to skin. How the idea of separating will feel in five years, in ten - in fifteen. When Georgie thought about divorce now, she imagined lying side by side with Neal on two operating tables while a team of doctors tried to unthread their vascular systems." And this one because this is totally how I feel about my husband too! "She thought of ... the way he never made made her feel crazy, even when she was acting crazy, and never made her feel like a failure, even when she was failing."